Facebook IPO: How much money does the social network make off each user? Are you really worth $100 to Facebook? Is Facebook worth $100 to you? The figure comes from a calculation that’s crude but instructive. When Facebook stock goes on the market for the first time, it’s expected to sell for $30 to $40 a share, a price that implies the company is valued at around $100 billion. Meanwhile, the social network’s recently amended IPO filing, released this week, shows that it’s closing in on 1 billion active users. Those users are Facebook’s product: It sells their attention (and, potentially, their data) to its customers, who include advertisers and online gaming companies such as Zynga. So if Facebook is worth $100 billion, then its billion users are worth, on average, $100. That’s rather a lot for a social-media company. It’s more than Yelp’s users are worth—the online ratings service’s $1.3 billion market capitalization implies that each Yelper is worth about $20. Facebook’s purchase of Instagram for $1 billion last month suggested a value of $25 to $30 per user. And what about Twitter? Its highly engaged users are worth about $70 each. The generosity of the $100-per-user valuation really sinks in when you consider how much Facebook’s users bring the company right now. It’s not $100. Or $50. Or $25. Or $10. No, Facebook earns a mere $4.84 in revenue per user per year, and just more than $1 a year in profit per user. In order for each Facebooker to be worth $100, they’d need to deliver that $1 in profit every year for a century, plus interest. In the past, the answer to any naysaying about Facebook’s value was always the same: growth. Vast, unprecedented growth. There were once people who thought Mark Zuckerberg a fool for turning down $1 billion from Yahoo in 2005, when Facebook had roughly a million users. Just two years later, Facebook had 50 times that many folks on board, and Zuckerberg was reportedly turning down $15 billion from Microsoft. With Facebook now nearing a billion users, that seemingly boundless growth is nearing an upper bound. The world has about 7 billion people, and only around a third of those have Internet connections. If every Internet user on the planet signs up, Facebook can grow to about 3 billion users—and that includes a whole lot of people in China, which blocks Facebook and shows no signs of relaxing its social-media policies anytime soon. 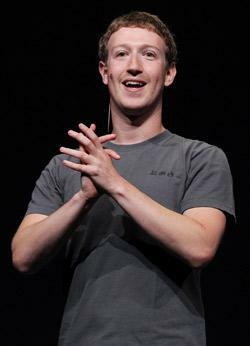 Besides, it’s probably fair to say that most of the world’s richest people are already on Facebook. Those rushing to sign up in India and Brazil represent an important market, but one that’s not nearly so lucrative as the United States on a per-person basis. While Facebook’s past growth has come from new sign-ups, the bulk of its future growth will have to come from wringing value out of its existing users. But the financial data in Facebook’s latest IPO amendment reveals that Facebook’s revenue per user has been relatively flat. In fact, despite its still-growing user base, total revenue dipped in the first three months of this year, and the company’s quarterly profit was the lowest it’s been since 2010. There are good reasons for both of those declines, and neither is cause for panic. Facebook’s $1 billion Instagram deal and its $550 million purchase of patents from Microsoft show that it’s still focused on long-term dominance, not short-term profits. And for all the gloomy pronouncements of a social-media bubble, Facebook remains a wildly profitable company. But if it’s going to justify its astronomical valuation, the social network will have to get creative. Facebook’s growth, then, will have to come from new realms. One can imagine some of the possibilities: selling users’ data to third-party advertisers; taking advantage of the smartphone boom by serving up location-based ads. And there are surely other ways for Facebook to make money from our data that haven’t yet been dreamt of. For those who dislike the idea of more ads, better targeting, and more data mining, there’s a paradox here: The more valuable you become to Facebook, the less valuable Facebook becomes to you. Right now, it’s a screaming good deal. You can use the site as much as you want—the average user spends 11 minutes a day there—without paying a thing, and Facebook makes only a penny or two a day from your patronage. The more value Facebook extracts from your data, however, the more the bargain starts to look Faustian to those concerned with privacy. In essence, you’re selling your identity for the chance to stalk high-school crushes and see what your friends are listening to on Spotify. All of which raises a question that few have dared to ask: Could Facebook start charging for its service? It will likely never put up a full pay wall: That would scare away loads of people, and if your friends aren’t on Facebook, then the site instantly becomes less appetizing. But as Facebook matures, it may find that a subset of its users would prefer to pay for its service in dollars rather than in information. It’s not how Facebook would prefer to make money, but it could be a safety valve in case of a privacy scare or regulatory crackdown. A premium service—one that costs, say, $15 a year—that offers up all of the site’s functionality without the data mining might be enough of a lure to generate some serious income. If you’re going to be worth $100 to Facebook one way or another, wouldn’t at least some people prefer to pay in cash?